From Versailles, to Opera houses, to Churches all over the World, to your own home, chandeliers are present in multiple establishments for good reason. I Love chandeliers in a home! In my opinion there should be a chandelier in every room, while we’re at it let's put one in the bathrooms and closets too! 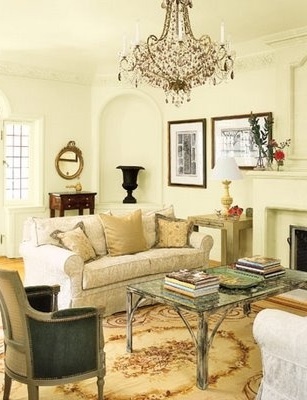 I love the whimsical feel and charm that a chandelier brings to any room. Hang one in your closet, it will look beautiful! Just because you're doing laundry doesn't mean you can't add a little class to your washroom! 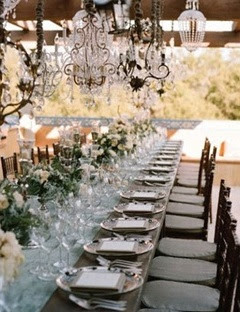 Chandeliers look fantastic at outside events. A Crystal Chandeliers is a branched, decorative ceiling-mounted light fixture. Chandeliers are often ornate, using dozens of lamps and complex arrays of glass or crystal prisms to illuminate a room with refracted light. And so it is! I absolutely love Crystal Chandeliers! I plan on doing a few follow-up post to this one in the near future, I hope you stop by again to visit my blog and thank you for your comment! I love Chandeliers! I think they are beautiful in any room! I would love to see pictures of the restored chandeliers you sell. Thank you so much for you comment and for visiting my blog. I hope you visit again!